The Toronto Real Estate Board just published the April, 2013 mid month housing market update. Below is a quick summary for the City of Toronto. Keep in mind that there was an extra business day during the first two weeks of April. The above stats look promising to say the least. You may even start wondering whether Toronto is headed for a soft landing or whether there is a Toronto housing bubble at all. I pulled out the mid month report for April 2012 and compared it to mid month report for April 2013. Then I entered the data from the two reports in Excel to calculate the sales and price changes over the year. Finally, I compared my calculations to the reported statistics in the present 2013 report. Quite a difference, eh? Especially when it comes to the sales volume. TREB reported that sales in the GTA declined by less than 1% (-0.77%) but when you compare the two actual reports the sales declined by 6.5%. Now what most likely happened is that the data got revised by TREB and the report from 2012 never got updated. Now that's fine but get this: in a year from now the present report will also be updated and the picture that we are being painted now could be completely different from what is actually happening. Look, originally in the 2012 mid-April report, TREB said that there were 1731 sales in the city of Toronto and that the sales went up by 1.47% compared to 2011 report. In the 2013 report, TREB revised the mid-April 2012 sales to 1638. That's 93 sales less than originally published a year ago. What this means is that in mid-April 2012 sales in the City of Toronto were declining by 4% and not rising by 1.37% as originally reported. P.S. Toronto condo sales have declined by 17% in the first quarter. Both median and average condo prices have registered a decline. 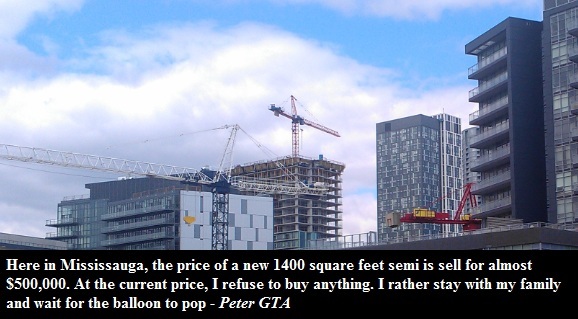 Looks like the Toronto condo bubble is no longer growing.